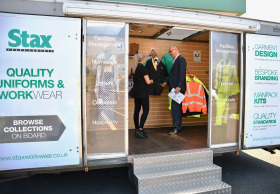 Stax Trade Centres has invested in a new mobile showroom that is visiting customers’ premises to showcase its workwear range. The showroom, which is mounted on a road trailer, is a first for Stax, which supplies workwear services to a wide range of businesses, ranging from small independent traders through to local councils, and major commercial organisations. Its trade centre in Glasgow also houses the company’s own dedicated workwear showroom and production facility. Mr Ellis added that the trailer also increases the level of contact Stax has with its customers and “provides a valuable source of feedback from the people who actually wear our garments”.